Hey everybody, my apologies for not writing much. Sure, it's national ice cream month, but it's also hot, hazy, and humid with no breeze month. The good news is that Sonic, America's Drive In, has come through to help us celebrate. This my friends is a $50 gift certificate to inspire me to go have an ice cream party at Sonic. No, I'm not trying to gloat, you see, Sonic has said I can give away a second $50 to one lucky reader of the blog! How very cool is that? 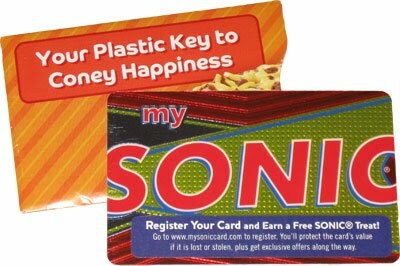 We even have a runner up prize: A sonic lunchbox that comes with "a "Keep it Real" ice cream t-shirt, a $5 MySonic card and some other fun goodies". So, we will keep this simple. Just (CONTEST OVER) and enter your name and email address. Next Friday (7/16), I will pick a winner and email them. Once they respond, I will announce the winners and also forward their info over to Sonic's marketing company so they can receive their prizes. How does that sound? Now, we're going to have a little side contest as well. Come follow me on twitter and tweet @onsecondscoop I want to win that lunchbox! (or something to that effect). One lucky follower will win the other sonic lunchbox (that comes with "a "Keep it Real" ice cream t-shirt, a $5 MySonic card and some other fun goodies"). How does that sound? So that's three prizes total and I thank everyone for participating in advance and hopefully this will not be our last contest. (side note: I will destroy the list of entries once the contest is officially over. The only info that will be passed on is when I pass just the winners over to Sonic's marketing firm).